Despite ever-improving conditions for millions of people around the world – documented by entities like the University of Oxford’s Our World in Data and highlighted by scholars like Steven Pinker – popular discontent is on the rise in many places. Given the depth of the transformation ahead, however, it is not just the policies themselves that must change, but the very framework on which they are based. This means abandoning the idea – which has shaped public policy for more than a generation – that the “market” must be the organising principle for collective decision-making. But there is an even more fundamental problem with assessing an economy’s welfare according to the satisfaction of individual choices. As the late William Baumol pointed out, if you assume that economic agents are independent, you will conclude that independent choices maximise their wellbeing. This is circular reasoning. The organisation of millions of interdependent individuals in a technologically complex society will always be difficult to manage. With productivity flatlining and public anger growing, it is clear that existing policies are not up to the challenge. Without a new approach, it is difficult to imagine a prosperous future for Western societies. Diane Coyle is Professor of Public Policy at the University of Cambridge. This content is © Project Syndicate, 2019, and is here with permission. Guess what - even the IMF are now revising their view of industrial policy saying (finally) that the managed industrial development of the Asian miracle economies might be the right way to go. Ideas change with the death of one economist at a time. Usually an empire declines because its overheads grow uncontrollably but its productivity does not. One little examined aspect of this is the inflation caused by increased regulatory overhead. Yet, effectively that is what destroyed the USSR. All that central planning has costs. It seems that often we get more regulation that does not increase value, but does increase costs, ie it reduces productivity. Why is that? Because regulation is aimed at the outliers - the people who put melamine into milk means everyone has to obey strict standards for food safety, even if they're just a small size operation that would by themselves produce food to a good safe standard. Basically the saying "this is why we can't have nice things". Do regulations have the desired result, though? Or do they hide the problem? Surely if you poison people they can seek redress without the need for regulation. Doesn't regulation just protect those in power? "The organisation of millions of interdependent individuals in a technologically complex society will always be difficult to manage". Bzzt - wrong frame of view employed. Anthills aren't 'managed' - any 'management' being observed is an emergent property of multiple inbuilt/genetically determined behaviours and physical attributes. Steven Johnson 'Emergence' is a useful primer here. The thought that trillions of individual human transactions can be 'managed' to any high degree is simply fatuous. Setting the equivalent of the ants' behaviours via environment, regulation, a shared civitas (itself emergent..and easily upset by too much Diversity), and enforcement, is about all that can be done. And even then, it's all dependent on relative peace, not too many external shocks, and a very high degree of mutual trust. "As the United Kingdom tears itself apart politically and constitutionally over Brexit, many of its citizens struggle with low-quality jobs, inadequate housing, and poverty so severe that they rely on food banks. 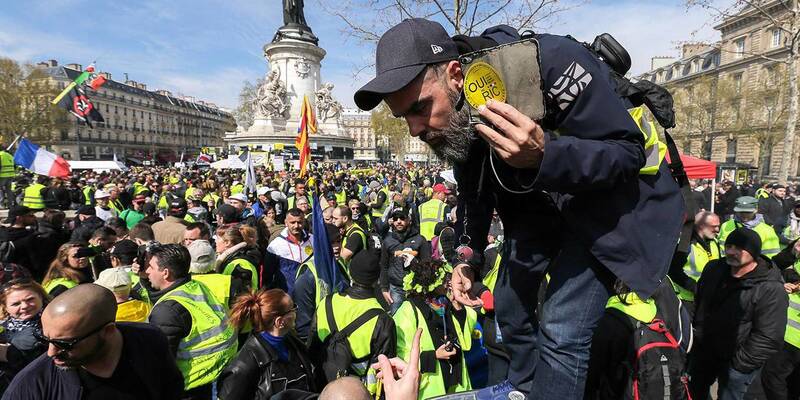 France’s Yellow Vest protests have been hijacked by violent extremists, but they reflect real grievances about the growing challenge of maintaining living standards." and herin lies the underlying causes of the Christchurch shooting. While some protest in the streets, others write letters to their MPs (which are largely ignored despite what they say), still others find groups to hate and to lash out at, but are not the cause of their anger and frustrations. These can be gays, religious, immigrants or what ever, but this anger and frustration is real. And this is why i asked after the Christchurch shootings, that the authorities did not stop at superficial fixes, some of which are necessary and others not, but to dig deeper and understand the true causes. When will they ever learn? Anger or frustration that modern life is passing you by might be real, it might be understandable. But lashing out against innocents can never be justified no matter how upset you feel you are. And the 'underlying real reasons' can never be used as justification for mass shootings - ever. And it wrong to conflate the two. Easy to do, but still wrong. An investigation of 'underlying real reasons' has to explain how a person can grow up with zero empathy and be feeling righteous as he shoots innocents including a small child who looks like my own grandchild. Does our western society over-value indivuality? The investigators need to include physcologists and moral philosophers along with police and security experts. Because only westerners engage in his type of slaughter. Nothing like this going on in Asia, Africa or the middle east. The three big attacks by white supremacists or equivalent: McVeigh, Breivik and our Christchurch man seem to be similar in being single men detached from society whereas most of the Islamic and IRA terror events, 9/11 and the terror attacks in Africa, Pakistan and Iraq were from groups who spiralled into an ever increasing hatred. Maybe I have it wrong but hopefully the investigation will dig into motivations and distrust of authority and not just discuss access to guns; terroist acts in the Uk prove banning guns although sensible is only a very pertial solution. Maybe the Chinese can help? I totally agree David. What I am trying to achieve though is for people who comment publically, especially Politicians, to realise that there are consequences to their words. that the ability to comment publically is not just a privilege, but has responsibilities. There are many groups and individuals in NZ, and around the world who find it useful for their political purposes to create and maintain racial, social and economic division. In NZ we routinely identify Maori as one of these groups as if somehow they are inferior, unable to make rational choices and decisions for themselves. Economic policies are made to protect organisations (Banks) at the expense of the public, to delay or not put any controls on the price of housing to the benefit of investors and banks, rather than those who need homes. All these choices have consequences that can create anger and frustration, and may ultimately lead to someone lashing out. We need to find ways to make better policy decisions, stop disenfranchising people, and work towards a better, healthier and safer communities. It might be a utopian goal, but that does not mean it is unachievable. After all why did you vote for whoever you voted for in the last election? That does not mean to say the other commenters are wrong. i just find them too superficial. Yes he was australian, yes he was a foreigner who could get a firearms license, and yes he could buy these guns legally. But take all that away and will the hatred, anger and frustration will remain, as will other means for mass killings. So i want the authroities to dig deeper, understand the true causes and address them too! The shooter was an Aussie who was rolling in cash he received from an inheritance. Don't try and portray him as some NZ loving social justice warrior. He is a bigoted incel who will hopefully rot in jail for the rest of his short and unpleasant life. The answer, of course, is to move to the left, rather than the right. Much of the world has done the latter. Governments need to enact fiscal stimulus, and they need to tax certain things higher, such as higher incomes. What makes you think this neo-liberal period the west has been obsessed with for the last 30 years has been a success? Do you buy into the myth of trickle down? Fritz why do you try to frame the question as if the govt has tried some new economic strategy? That is a lie. The opposite, being govt intervention as a relatively new phenomenon, is more accurate. Either way, framing it this was only leads to arguing the extremes, which is unhelpful. I find it disheartening when someone declares "of course such and such should happen" when describing what economic rules should apply. Wherever you sit in the left/right economic spectrum is just your opinion; nothing more. And no the trickle down theory is not a myth. How much income trickles down depends on the supply and demand of whatever good or service is being offered. Doctors for example are in relatively short supply, and they get quite a heavy trickle from those with capital. Cleaners in comparison are a dime a dozen, and can only extract a mere trickle. Govt action such as social welfare for those that are unemployed is a good thing in my opinion, and setting a minimum wage goes along with that so that the welfare doesn't become corporate welfare. Fiscal stimulus I believe can be a good thing where debt is low, and the investment is in public infrastructure. These are not extreme views and I do not agree with you that a lurch to the left is required, in the economic sense. The sensible things to do is find the cause and then the cure. The external cause is the closing technology gap between developing and developed countries, namely China and G7. Things in the developed world will get even worse in the next ten years if this gap were gone or even reversed. The China's Manufacturing 2025 report aims to catch up and even surpass in high tech areas. The internal cause is that any radical policy changes in income distribution, sector policies, education policies, welfare policies, environmental policies are nearly impossible under the democratic political system. though is on Tibet. Similar progress happend in Xin Jiang as well. Western media has always reporting this issues negatively against China. Chinese coins used to have a hole in them. Some good points. I think the case to move further left will be stronger in 5-10 years after our society has become even more unequal and even fewer people own homes. When your middle class fails, so does your economy, and your country. 1. Build housing that the middle class can actually afford. This will require the government to build lots of housing (beyond social housing). Even in the rare case that the middle class can afford the current silly prices in Auckland, they won't have much money left over to spend or invest. Which isn't good for the economy. Of course, this is a bit of a 'forward looking view'. There are many people in the middle rung of society who bought houses more than 10 years ago when they were more affordable. I'm talking more of the young middle class today, and that of the future. 2. Increase taxes so that the country has the revenue to get the basics right. Our education and healthcare systems just aren't good enough. They don't pay their staff well enough either, but that would at least partly be resolved if we did 1). I'm always open to other opinions. Maybe you can say why you think there is a better way to achieve these goals. Or maybe you don't think these goals are important. 1) Unfetted capitalism leads to a very few rich and many slaves. The richer can always save or invest money, the poor cant. 5) The internet and social media give us all much quicker and more in depth access to whats going on in the world. 11) In the end we have to be much smarter and productive about the use of money, especially government spending. It should all go through business case assessment to ensure it provides socioeconomic benefits. 12) Top tax rates have to increase. Capitalism only works if money is recycled to the poorer in society. They also deserve access to shelter (not garages), food (not food banks), education & health care. Some research papers estimate the most efficient marginal tax rate at around 60%. 13) We need to reform democracy further. People need to be able to vote issue by issue, not party by party. MMP needs a lower threshold to allow political innovation. Democracies with presidents with too much power are effectively autocracies. This is the world's resources being divvied up a bit more equally. Notice, however, the rich do not have to participate in this game. Time to stop giving them a free pass. That's rather a egotistic veiw that as modern, our current social and economic trends bear no resemblance to 100 or even 1000 yrs ago. Either way a stable middle class.. Doctors, trades people shop keepers etc. that earn approximately 50% of the socierties/county's wage salary have a stable growing economy and society. History shows as this 50% of earnings incomes moves either way outside of the middle 50% of the semi skilled (truck driver) skilled (teachers nurses) highly skilled (doctors professors surgeons) 50% things become unstable. Kiwi build can't sell houses.. Not cause unaffordable but because those being targeted no longer earn the income to buy. Nurses, teachers, doctors,midwives start to become vocal and strike. The people who spend the dollar, and gets spent again, and again, growing the economy and social well being no longer have the income to do so. This is where the core problem lays and why this cycle continuously goes round and round. Dissatisfaction with state institutions has been at least a contributing factor in the rise of populism and social unrest in developed countries. A recurring theme in the countries that are most unhappy seems to be public policy that is developed in the face of widespread opposition from ordinary citizens. Suggesting more technocratic government divorced from input from the populace seems a cruel joke. As for AI and technology, they are happening now, and most developed country unemployment rates outside the EU are practically as low as they can get. Funnily enough the EU has never been keen on anything approaching direct democracy. Suggestive perhaps. I no more take notice of figuges about improved "GDP" or "the Economy" - whatever the hell those thingd are. However I would take notice if a politician used language about "improving New Zealanders incomres". Strangely - they dont say those words.